Missouri River Country is home to a number of museums, most of which are dedicated to the preservation of Montana’s pioneer heritage; however, there is much more than that in this beautiful stretch of Montana. If T-rex hunting is more your speed, you’re in luck - the Montana Dinosaur Trail runs right through Missouri River Country offering many opportunities for in-depth dino discovery! 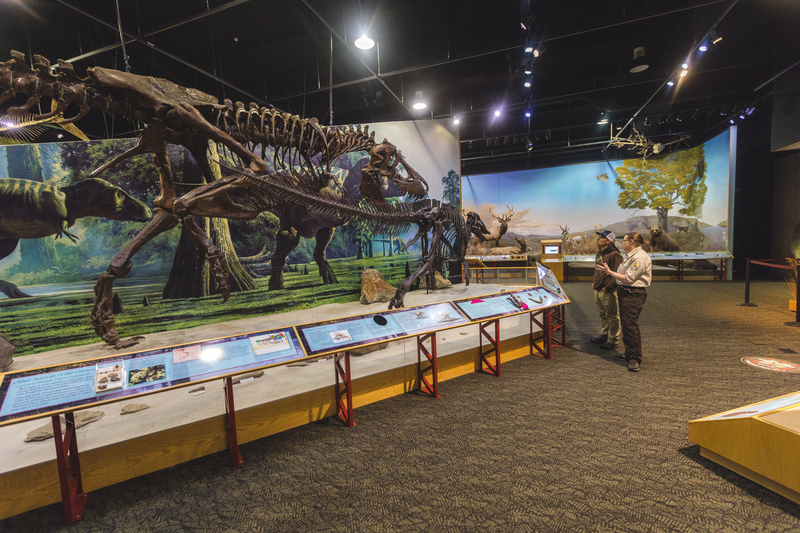 Get a glimpse of our region’s vivid history at Valley County Pioneer Museum, where you can follow a chronological timeline from the age of dinosaurs to present day. Once you’ve traveled through time, don’t forget to check out the country’s largest collection of Assiniboine artifacts. Phillips County has been overtaken by cowboys, outlaws, pioneers and dinosaurs throughout history and Malta’s Phillips County Museum chronicles each and every one of them. Their ever changing exhibits reflect all of these ancient inhabitants, while simultaneously looking toward the future. Grab your dino passport - Phillips County Museum is a member of Montana’s Dinosaur Trail. It’s clear that there is no shortage of dinosaur discoveries in Northeast Montana - cross the street from the Phillips County Museum and you’ve made it to another stop on Montana’s Dinosaur Trail. Though the Great Plains Dinosaur Museum closes during Fall and Winter, visitors are welcome May through August when the museum is full of programs and activities like their interactive dinosaur digs. The MonDak Heritage Center serves as a cultural hub for Northeast Montana and Richland County. Check out their calendar for events and new exhibits—we’re especially excited for their annual Youth Art Show. If you’d rather be transported to the past, we suggest exploring their replica of a turn-of-the-century pioneer town. Explore life as it was in the 1890’s-1940’s at the Culbertson Museum. The “Old West” is recreated in their lifelike display of cowboys, pioneers, and homesteader artifacts. Unlike your typical museum, the City Museum in Poplar is housed in an old tribal jail house built around 1920. The ceiling is still covered in re-bar after prisoners escaped through the original roof, and the initials of prisoners remain carved in the walls. From ranch life to wildlife, the McCone County Museum is a great resource for all things Montana. Don’t let the outside deceive you, their collection goes on and on once you enter. The journey doesn’t stop at the Fort Peck Dam - near it lies the Interpretive Center, thanks to the U.S. Army Corps of Engineers and U.S. Fish and Wildlife Service. Stop by yet another member of the Montana Dinosaur Trail and learn about dams, dinosaurs and more. Once the most important fur trade post on the Upper Missouri River, Fort Union is now a historic site full of activities and artifacts for visitors to enjoy. We suggest a self-guided tour through the reconstructed fort or a hike on the Bodmer Overlook trail. Education and adventure go hand-in-hand at the Children’s Museum of Northeast Montana. Kids can wander through their “Great Outdoor” exhibit, complete with an indoor treehouse and climbing wall. The journey continues through their World Wildlife Exhibit, containing over 100 animal species that you’d never imagine seeing in one room together! Don’t let the town of Jordan, MT deceive you with its small size. The Garfield County Museum is a part of the Montana Dinosaur Trail, and highlights the incredibly important fossil discoveries in the region. The Sheridan County Museum in Plentywood mixes past and present with pioneer artifacts and information, alongside art from current locals. View a town favorite and check out their 74 foot mural, depicting the story of Sheridan County from the time of early Native Americans. More than a museum, the Scobey Pioneer Town and Museum sits on 30 acres and includes 35 reconstructed buildings that mimic a pioneer community in the early 1900’s. The Wolf Point Area Museum highlights Indian culture and early-day settlers with an array of artifacts, including their life size statue of cowboy artist Charles M. Russell. Lambert may be a smaller community (with a population under 200), but it is still well worth the pit stop. Visit the Lambert Historical Society Museum May through September to view highlights like their homestead history display.